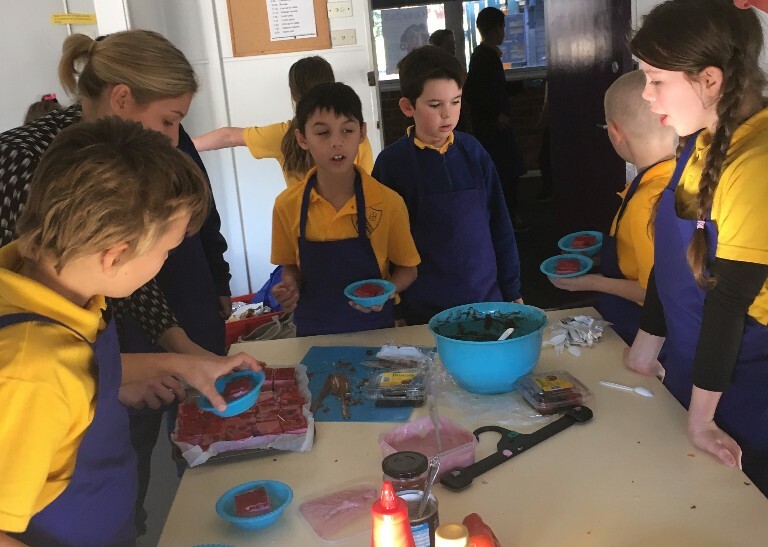 Although NAIDOC Week fell in the holidays this year, Lake Heights celebrated with lots of events on the last Thursday of term 2. Students from across the school turned out in red, black and yellow and were treated to lots of special activities. 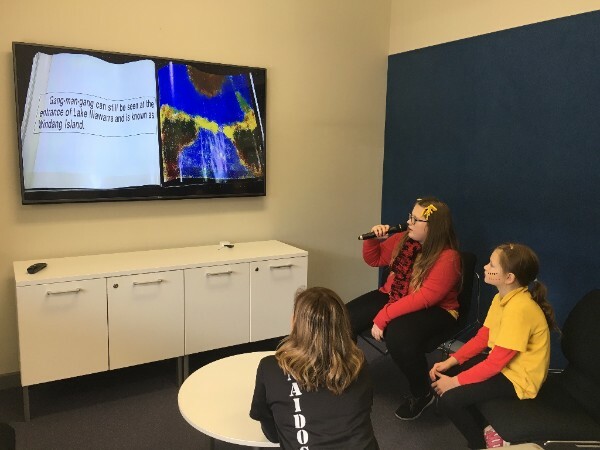 We kicked off the day with a shared-screen reading of a local Indigenous story, Gang-Man-Gang, read by Aboriginal students, Asharnti Duncan and Ruby Lee. They did a fantastic job and students enjoyed hearing a local story. 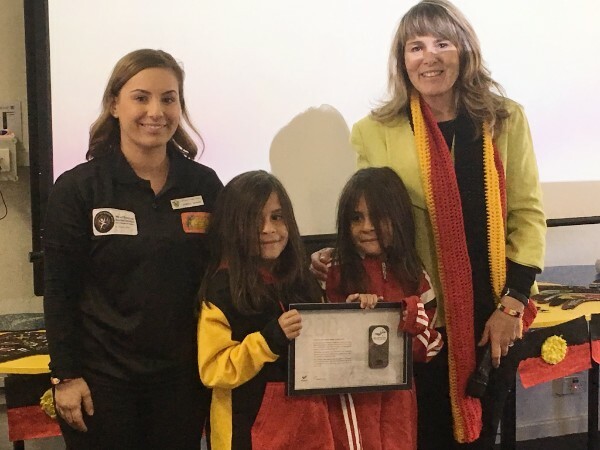 Our Aboriginal families then joined us for a special morning tea in the library, where Councillor Vicki Curran presented a medal to the Indigenous community. The medal displayed in the office foyer, commemorates 200 years since European settlers were guided down the escarpment to the Illawarra by its traditional custodians. Over the week, students across the school decorated a boomerang and our Aboriginal students each selected a winner. The winners were presented with their certificates at a whole-school assembly. Congratulations to the following students who took out the top honours: Jairone Agostini, Bronte Richards, Kiara-Jade Tarrant, Jayme Bruce, Sienna Garrity, Isadora Novakovic, Crissa-Mia Kennedy, Darnell Te Ahuru, Ti-Amour Kupenga, Palu Tausala, Abby Kresevic, Zane Mason, Abigail Esteves, Mikayla Morales. We are so proud of the way that our entire school embraced NAIDOC Week celebrations and everything that it represents. Thank you to Mrs Upeski, our Aboriginal Learning and Support Teacher, for her role in organising the events for the day. Later this term, Lake Heights will combine some of its most popular celebrations into one, fun-filled day! With the upcoming Rio Olympics, just around the corner, we'll be hosting a mini-Olympics and International Food Fair on 18 August, and will be combining this with our annual Open Day. It's sure to be an epic celebration of multiculturalism, diversity, teamwork and student achievement. Details will follow closer to the event, but if you have any ideas or think you could make a contribution, we'd love your input at the next P&C meeting on Monday 1 August at 7pm. The District Athletics Carnival will be held on 27 July. See below for additional information. Mr Finkernagel has begun his new role at Port Kembla P.S. Mr Hurd will be the 5/6 teacher for the remainder of the year. Save the date! There will be a P&C Meeting held on Monday 1 August, at 7pm. 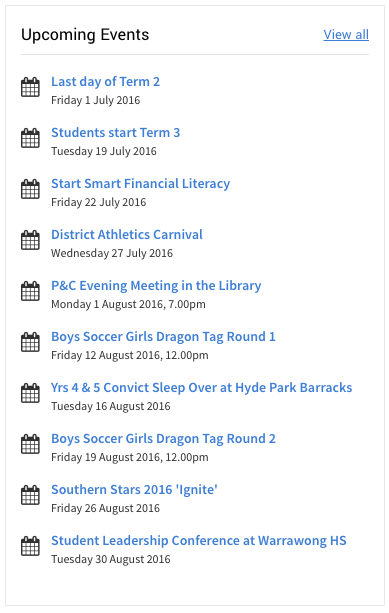 There'll be lots on the agenda including a discussion of the arrangements of the upcoming Mini-Olympics and International Food Fair, as well as a presentation of the new Maths 'n' Movement program that classes have begun to adopt. See next week's newsletter for more information. The Commonwealth Bank will present a Start Smart Financial Literacy lesson to each class during this week. 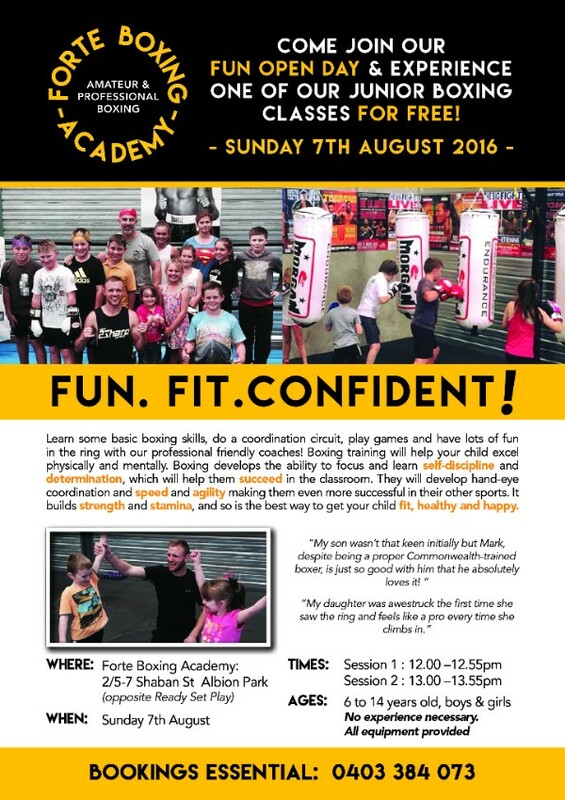 The lessons are always engaging and have proven to be very popular amongst students. Merit Awards will resume next week. We couldn't have asked for a nicer day for our excursion to the Discovery Centre and Botanical Gardens in the last week of term 2. Students had a great day exploring the Discovery Centre and thoroughly enjoyed our walk through the Botanical Gardens and playing on the fantastic playground. 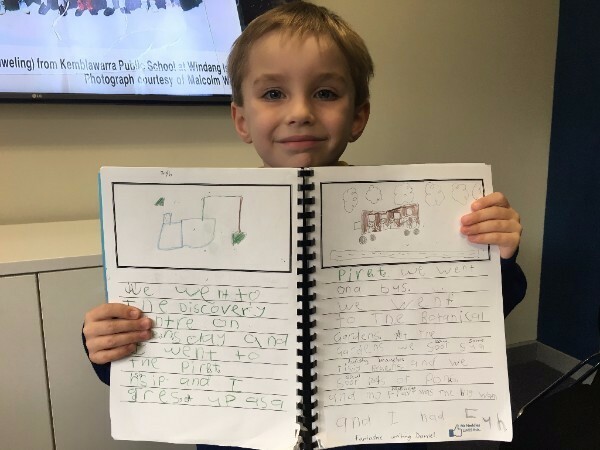 Daniel from Kindergarten, wrote an excellent recount of the day. See our Facebook page for lots of photos and video highlights from the day. Look out Masterchef! 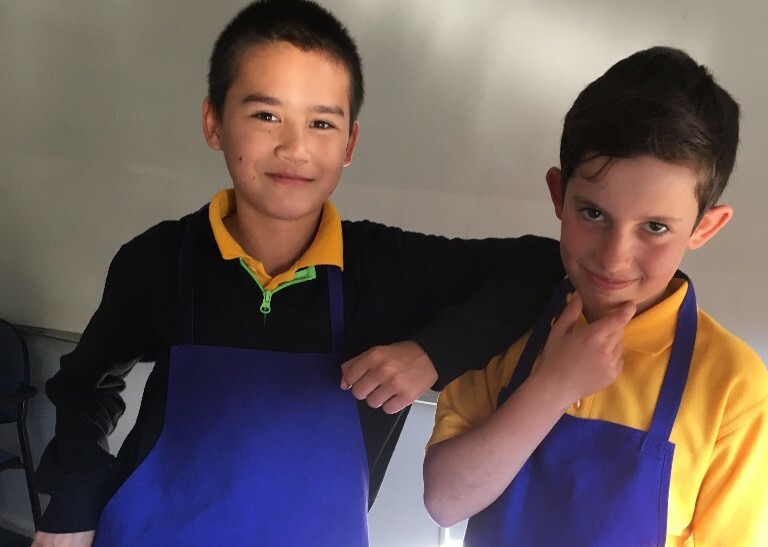 In the last week of Term 2, students from the Tuesday afternoon cooking group spent hours cooking up a storm for their pop up restaurant, The Lakeview Snack Shack. The group, led by Mrs Sernig, worked tirelessly to create all aspects of the restaurant, from writing and making menus, to creating table centrepieces, and of course, naming the restaurant. Students created an impressive 6 course degustation for their parents, along with Mr Heddles, Mrs Whyte and Mrs Norman. 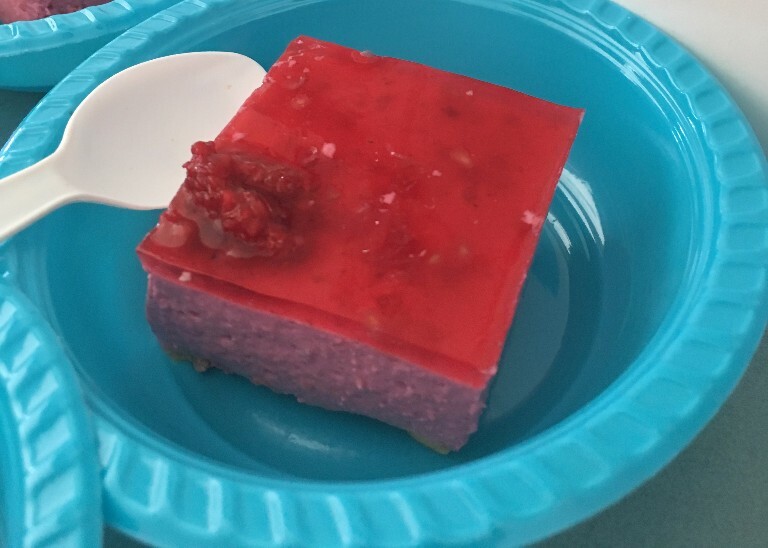 The menu included feta and sundried tomato scrolls, mini pizzas, spaghetti bolognaise, sushi, chocolate mousse and strawberry cheesecake. Students donned their aprons and spent their lunch time kneading dough, whipping mousse and chopping veges for their meals. They all loved presenting their food to parents and were complimented not only on their fabulous cooking, but their professionalism and attentiveness when waiting on their guests. Our cooking group came about in response to a focus on healthy nutrition choices at Lake Heights. We know that kids who eat a more nutritious diet, often achieve better outcomes at school. 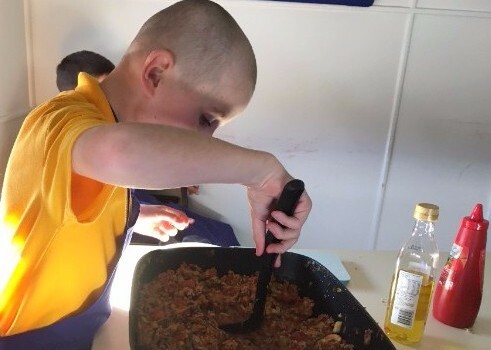 Our hope is that by helping students to understand that healthy food can be delicious and fun to make, we can secure a long and healthy future for our students. 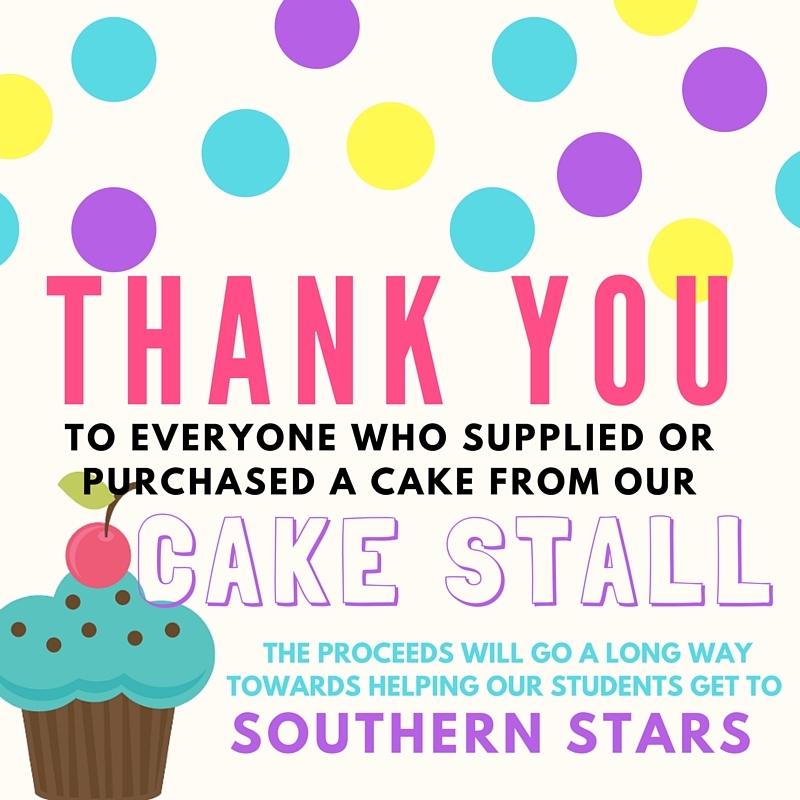 Well done to all of the students who were involved on the day. It was an impressive display of what our students can do and we look forward to seeing what our cooking group has in store next. Special thanks to Mrs Norman, who spent hours sewing aprons for our students to wear, and Mrs Cherrie, who helped in the kitchen on the day. Come and join us for the South Coast PSSA District Athletics Carnival. The event will be held over one day at Beaton Park, Wollongong on Wednesday 27 July, 2016. Students will be travelling by bus at a cost of $12 per child or $20 per family. This includes entry fees into Beaton Park. Although there will be a canteen available on the day, students are encouraged to bring their own recess and lunch, along with a water bottle. Notes were sent home to all students eligible to compete on the day, in the last week of Term 2. Please see Miss Hunter if you require any further information. Later this term, Years 4 and 5 will be convicts for one unforgettable night at the Hyde Park Barracks! They will be lodged in the convict dormitories where tens of thousands of convicts slept between 1819 and 1848. This is as close as anyone can get to experiencing the life of a convict. Students will be travelling by bus to Hyde Park Barracks and will sleep the night at the barracks under similar conditions to convicts. It is a fantastic opportunity for students to become immersed in some of the history that they've been learning about in class. Lake Heights has secured a substantial subsidy for students and the entire excursion, including bus trip, accommodation and food, will cost only $10. Permission notes will be sent home this week or are available for download here. For more information on the program, please click here or see our school events page. 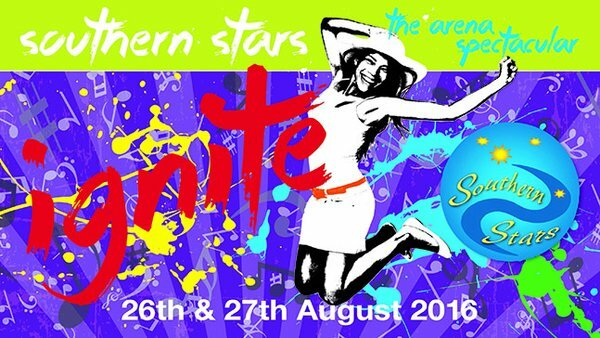 The Southern Stars Performance is only just over a month away now and our students have been ramping up the rehearsals to prepare for what's in store. If you haven't already purchased your tickets, time is running out. See our events page for more details and to purchase tickets for both the matinee and evening performances.